I was a bundle of excitement whilst waiting the week it took to ship all the way from the States, (from which they offer free worldwide delivery FYI) and it absolutely did not disappoint when it arrived. The silver hands are so stunning against the Sapphire crystal glass, and I love the print of the Zebrawood, it really catches the light beautifully. I'm completely obsessed. Can you tell? 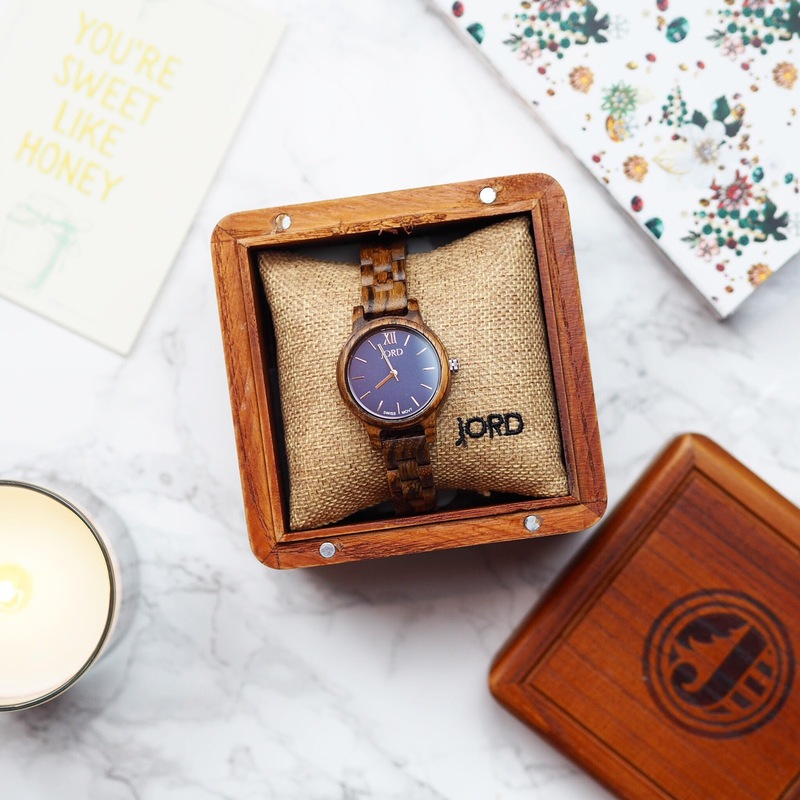 I also love the gorgeous wooden box and hessian pillow the watch arrives in. 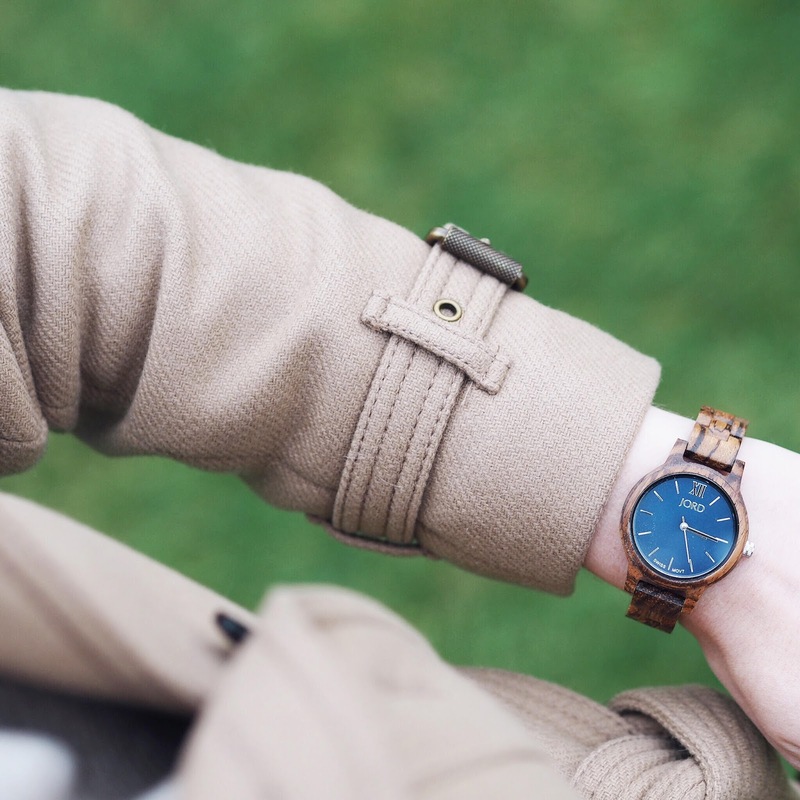 The concept of wooden watches is so cool and unique so it's great that they kept to the wooden theme with the packaging too. JORD have so many amazing watches for both men and women, some more subtle like the walnut and ebony, if you didn't want the wood grain to be as prominent; and some really edgy, vibrant options too! Taking a quick look through their Instagram feed is a drool fest - I wanted about 7 different watches after my first insta-stalk! 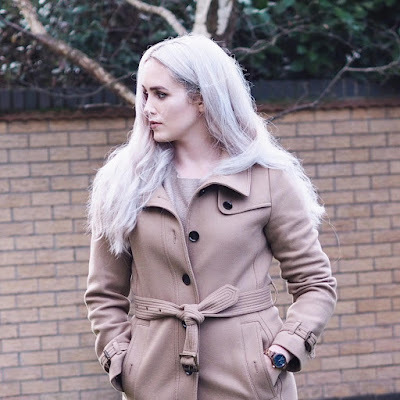 I felt that my Burberry Trench coat was the perfect piece to wear with my JORD watch, because of it's classic colour, and sharp, tailored features. 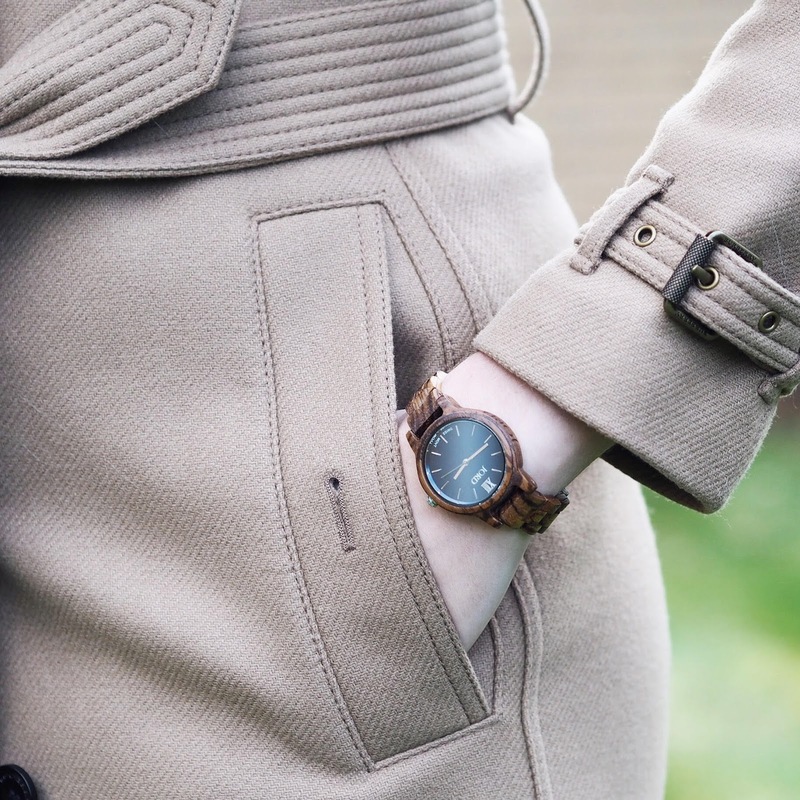 Although this is very much a statement watch, I still think it's so wearable, and I can't tell you how many compliments I've had in the few days I've been wearing it. The sizing was perfect and also a really easy process (Thank goodness - cause the pressure of having to get it right first time was a bit daunting to be honest!) They ask you to take a fabric measuring tape (OR print one off using their clever scaling guide) and measure your wrist to the nearest quarter centimetre. I added on an extra quarter to be on the safe side but the watch does actually come with extra links if you did wish to alter the size. 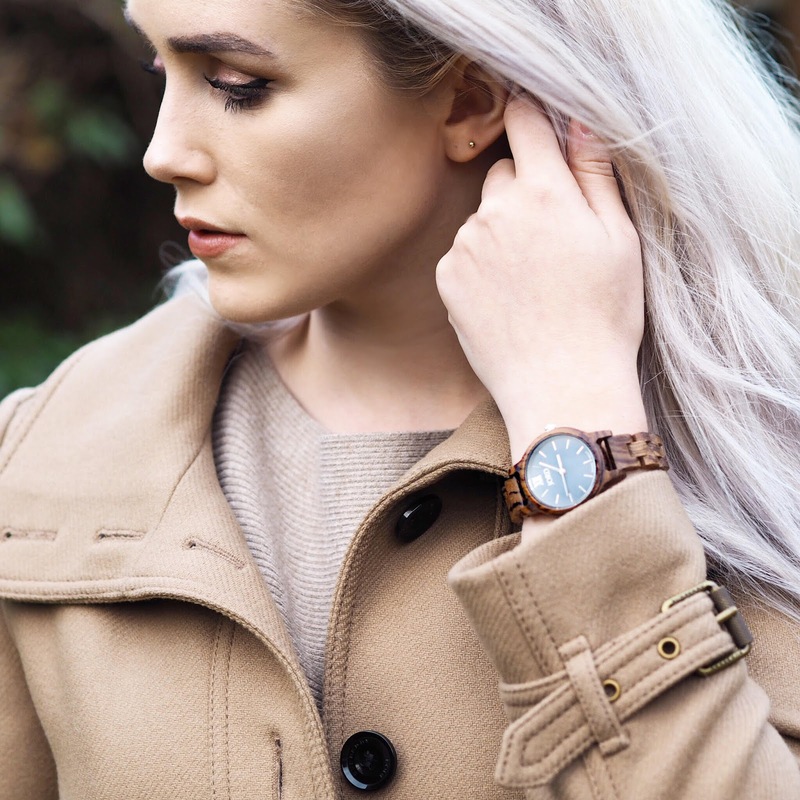 The lucky winner will receive $100 towards any watch on the JORD website, so good luck trying to choose a favourite! All you have to do is click this link right here, fill in your details and select your favourite JORD watch from the drop down menu! Simple as! You have until the 28th of January to enter (so get your skates on!) and then JORD will pick and contact the winner. I'm beyond in love with my watch. It's just so stunning, and would make the perfect gift for someone special (or a gift to yourself, you do you boo). 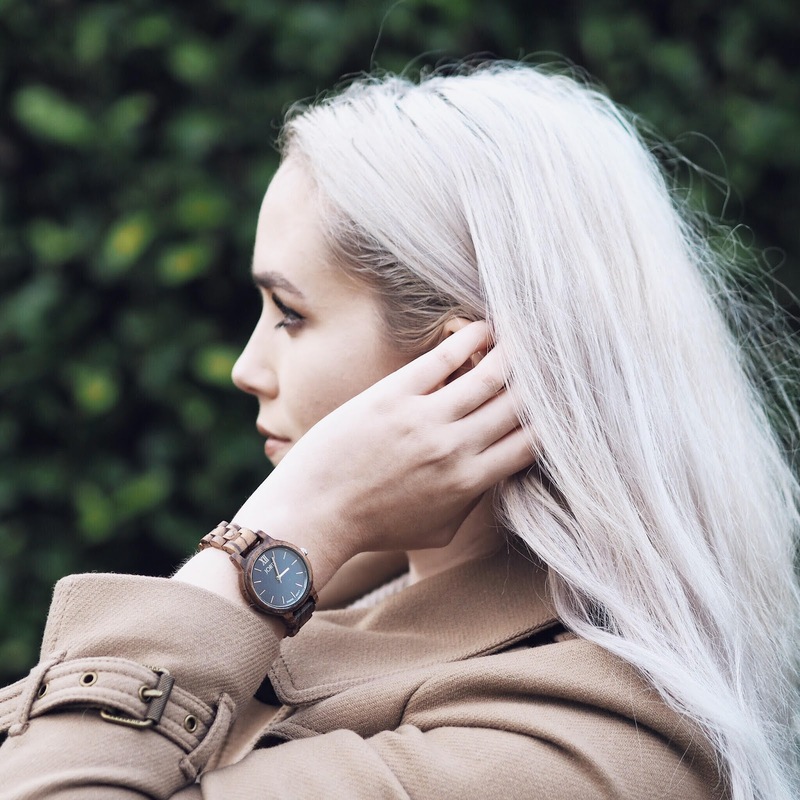 I feel like so much thought and intricate design work has gone into JORD watches so I'm genuinely pleased at how successful and popular the brand has become. They run from various evaluations of value to various size to different sorts of wood itself. So here are a few and subtleties to note when you're picking the wood for your wood working venture. It isn't on the grounds that they do not have the learning on the best way to deal with their time or that they have lost the enthusiasm of embellishing themselves however it is on the grounds that the twenty four hours in multi day isn't sufficient to juggle the two universes,Michelle Pfeiffer Skin Cream the profession and the family in addition to their self.